I have covered quite a few of the ‘Unsung heroes’ in my regular posting. I am now collecting all under this page. I shall collate them soon..
My travel itinerary crisscrosses me across the country and as I share usually, every visit to a city brings me across a few exciting personalities, amazing characters, yet unknown and unsung. They are heroes in their own right. 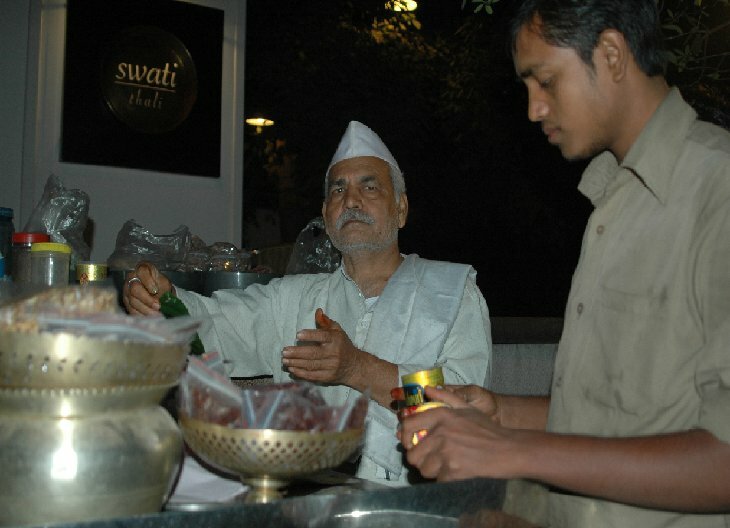 While on the streets, the most omnipresent business is street food. What would the streets be bereft of these hunger quenching souls? Most of the times, you and I do not take notice of or acknowledge. Many of them remain nameless and we do not bother to know about. I am sure most self-professed management gurus would take umbrage to calling these unsung as entrepreneurs. A few of these unsung are young and rearing, while quite of few are wizened and have been doing business for decades but have not bothered to create a brand of their own nor scaled up. Yes, many of them are brands, unbeknown to themselves and they have not cashed in. When I interact with these unsung, I find them either happy and self-contended with what they are doing, or find themselves ill-equipped to take their business to next level. Most are looking for a young, dynamic youngster with a vision, well-equipped to facilitate their business to the next level. This is where I wonder what a young entrepreneurially-spirited MBA Can do? Unfortunately every MBA is seeking a job, and almost every B-school is a glorified placement agency! Can we challenge the young to create success stories. In the next part of my series, Unsung heroes, I am covering yet another inspiring gentlemen from Madurai who is the serving the hungry – you and me. I took a night state transport bus from kochi to Madurai This march. It took me eight hours and disembarked at 5am. Jayant and Guhan, two of my CL friends picked me from the bus stand in Madurai and took me to a ‘modest’ hotel. For me it was a luxury. Since my day from 10:30 was choc-o-block, I wanted to visit the city, especially Minakshi temple and the old city before the day begins. At 7am we left for the temple. What a creation it is, a 3500 year old edifice, though renovated twice extensively since then. I shall blog it in my travelogues, as that is a different story. We finished our photoperambulations around the temple complex and exited to the hotel. guhan asked me whether I would like to have a juice to start the day. I volunteered! On the way he stopped by the roadside, in front of a soup vendor and asked ‘how about a soup?’ this was a roadside make shift soup vendor, who had a couple of tables with three large steel drums and a few serving tools. I noticed a flex with photos of green leafy vegetables with labels. 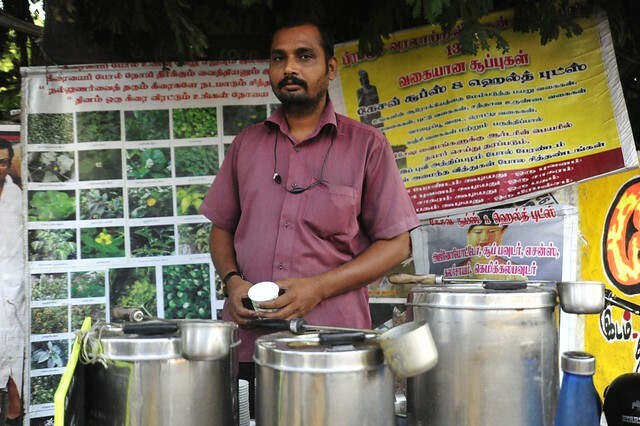 There was this thirty- some young man, ponnuchammy, dishing out soup to his clients. I was taken in by the concept and as is my want asked ponnuchammy about the idea. He shared that he was earlier into some other small business and as someone in the family was not well stumbled upon this concept. More research on ayurveda yielded new ideas and thus business emerged. Ponnuchammy showed the flex board behind him and went on to share the medicinal and health values of the herbs in the pictures. They were in all about 12 of them. He shared that he keeps three soups every day, and the soups change very day of the week. Asking a few questions about my health, he suggested that I have a particular soup. And I did. I was a little curious to know more about the business. Ponnuchammy starts his day early at 2:30am with cleaning, gleaning and boiling the herbs and creating the soup concoctions that pet ready by 6am. He transports them to the road-side shop of his by 7am and he exhausts all of his stock by 10am. The financials of the business.